On Saturday, March 25, the free Community Clean Up is back at the Sentinel from 9:00am-3:00pm. 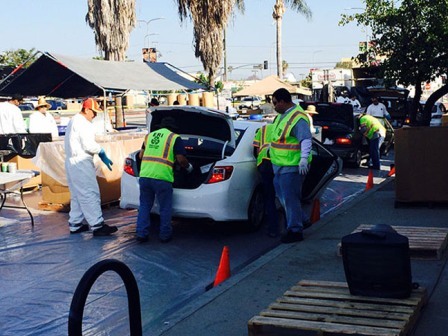 This is the community’s one-stop event to dispose of unwanted materials around the house. The event is a drive-thru, allowing the community the chance to drop of items without leaving their cars. Mothers In Action is happy to assist in providing the services to the community this year. This community event is made possible by partners and representatives including Mothers In Action, Los Angeles Sentinel, Supervisor Mark Ridley Thomas, L.A. City Council President Herb Wesson, Assembly Reggie Jones-Sawyer, Los Angeles Sanitation, Copy City, Crenshaw Chamber of Commerce, Public Works, Shred-It USA, Empowerment Congress West Area and SoCal Gas. Some of the items you can bring include: paints, automotive fluids, cleaning products, pool and garden chemicals, aerosol cans, unused medicine, auto and household batteries, fluorescent tubes and bulbs, mercury- containing gadgets and SHARPS (needles, syringes, carpules, lancets, endo files, prefiled pens, etc.) Electronic materials will be accepted as well including: computers, printers, cables, telephones, televisions, microwaves, video games, cell phones, radios, VCRs and electronic toys. 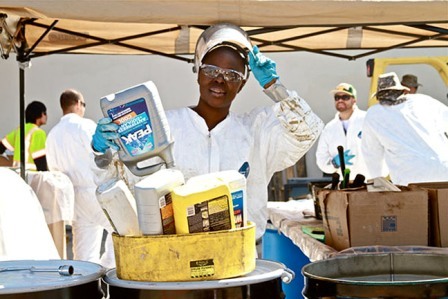 There are some materials that will not be accepted at the event such as: business waste, containers over 5 gallons in size, ammunition, explosives, asbestos, construction waste, fireworks, furniture, radioactive material, biological waste or tires, refrigerators, washing machines/ dryers, conventional ovens, paper or computer software. Shredding confidential documents will only take place between 9am-12:30pm and only 2 (33 gallon) trash bags per customer is allowed. Please have papers loose in bags and ready to be shredded. Shredding services are sponsored by Empowerment Congress west Area. This is a chance to get rid of all those items that required specialized disposal and recycling. The drive-thru line for the free Community Clean Up starts at Bronson and Coliseum.